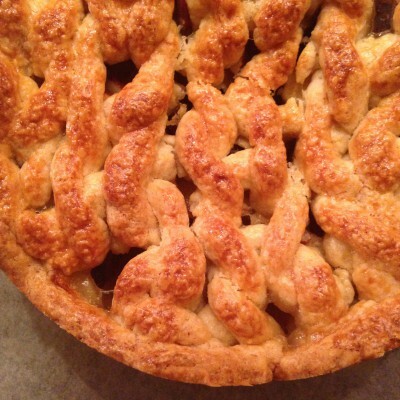 This website being “Knitter’s Kitchen” – there ought to be a blog post about something edible once in a while, right? Well, the past weekend I made something edible: An apple pie with knitting on top. I had seen a project on Ravelry a long while ago of someone making a knitted bread (link only works with a Ravelry profile, I’m afraid – those are the settings by the user who posted it! ), and had determined I wanted to try this out. Let me just say that cake dough (based on butter, mainly) is not the most easy material to work with! Sticky and quickly softening, I soon abandoned the knitting needles I had planned on using, and started out just laying the “yarn” in the right shapes on the kitchen counter. 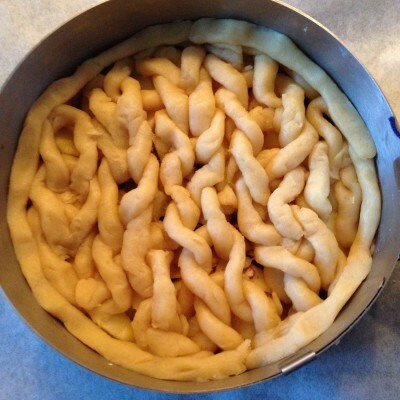 Having done that, then trying to transfer that onto the pie, was really not a good idea… It all fell apart. I ended up “knitting” it by hand directly on the cake, trying to connect bits and pieces of dough strips of around 10 cm / 4 inches. A little bit fiddly, as the cake tin I was using was taller than the cake itself, so there wasn’t much room to work on. 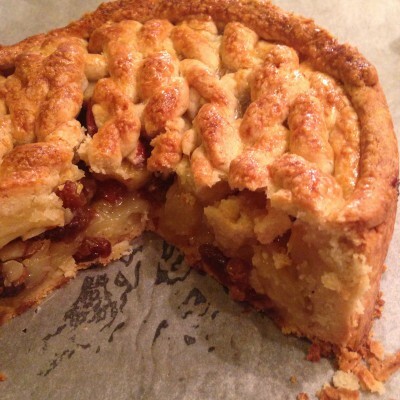 I didn’t want to make a full portion apple pie, as it would just be me eating it, and a whole cake is, well, a little bit much… So I used a ring that can be adjusted in size, and set it to the minimum size possible (about 16 cm / 6.5 inches in diameter). I think it turned out pretty well anyway! 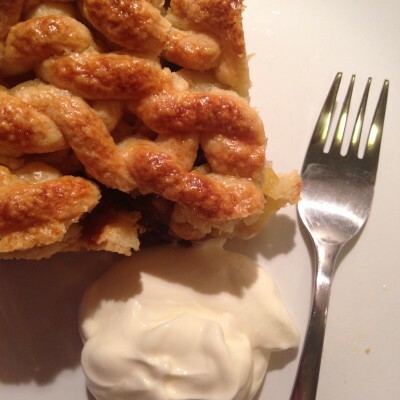 The apple pie recipe I used is the one my mom always makes – I put that recipe on the blog a couple of years ago: Apple cake recipe (on demu.dk). I made a full portion of the crust, but didn’t use all for this cake – also, I didn’t make a full portion of the filling. I used 2 quite big apples, a little handful of raisins, and a little handful of almonds. 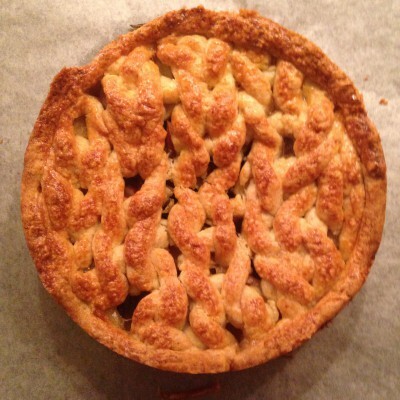 Incidentally, I saw on Ravelry this weekend that someone else made an apple pie with a knitted crust a couple of years ago. 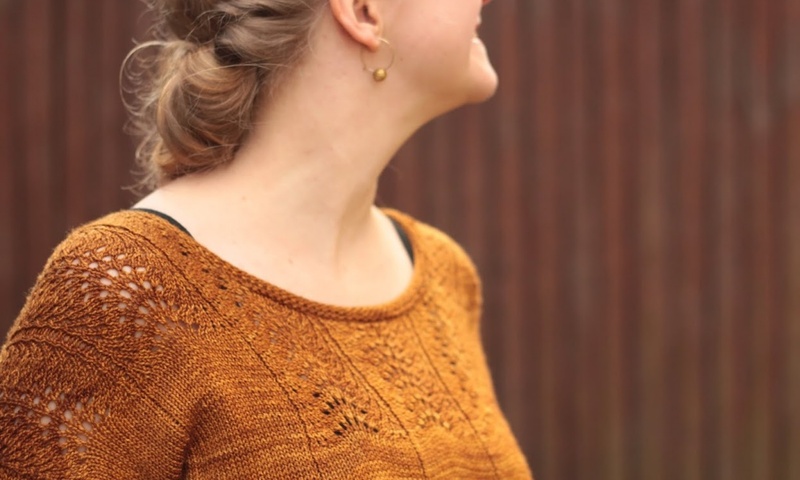 This is her project page on Ravelry, it’s pretty cool!